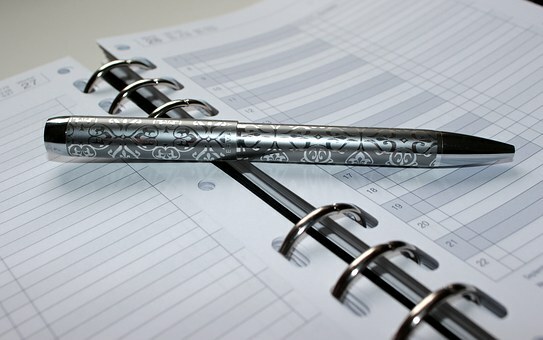 Your to-do list is a key tool, and we have talked about the importance of having one and how to use it in other posts. Today we will go one step further and see how you can use your list more effectively. 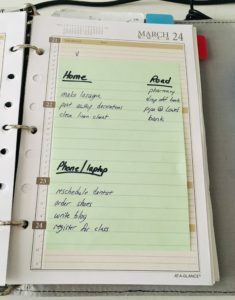 You can sort your to-do list into groups that help you choose one more quickly in the moment. If your list has three boxes (or colors, or columns, etc.) — At Home, On the Road, On the Phone — you can go directly to that section when you are in that place. For instance, when you are waiting for practice to end, you can look right at the Phone tasks and pick one phone call to make in those few minutes. You knock it off at the best time, and you don’t have to review your entire list to see what could work at that time. Your Home tasks will be front burner when you are home with unscheduled time for taking care of that stuff. Your Travel tasks will be the group you tackle on the way somewhere or during the 2 hours of “getting out” time in the morning. Your Phone tasks can be calls or updates in an app or online orders or online research — whatever is needed and fits for that tool. If you use tech options for your to-do list, those should have filters or labels or folders that allow you to divide up your list in these groups. This doesn’t change your need to prioritize your tasks and activities, but it does help you know where to go when you have an opportunity that only fits some tasks. In my role as time management coach, people occasionally ask what my planner looks like. So today we’ll look at it. Please keep in mind that what works for me may not be the best tool for you. So take a peek and use what you can. 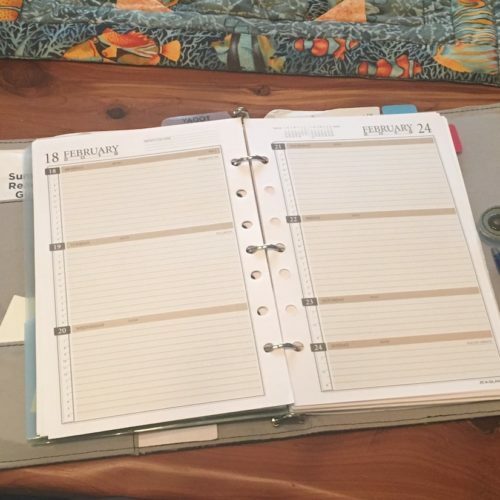 My planner is paper. This was a change a couple of years ago when my days became more mobile. A binder, that is small enough to hold easily, can come with me from place to place and be where I need it. In addition to the calendar, it also holds coupons and shopping lists. I’m not a huge fan of paper in general, so having every bit of paper I need in one place is helpful. The calendar is a week per spread. This is the right balance for my days — enough room to write various appointments and details but still small enough to see the whole week at once. A monthly option isn’t quite enough room, and a page per day leaves too much empty space unfilled. The days contain appointments and tasks. One side of the sheet is marked hourly, so I can put appointments and commitments at the right times. The other side is for a to-do list, so I can keep track of tasks for each day and the week. Having them side-by-side is important for my success. Both parts work together to map out the day. The pages are plain. Color-coding can be useful, but I don’t get enough benefit from it. I use whatever pen is handy (one on my desk or the one in the planner loop) to write what is needed. It just needs to be legible until it’s past or crossed off.